When using a sports app and recording motion trails or using Google Maps, it will use the built-in GPS. It has large memory space, 4G ROM, 512M RAM for you to use; 300mAh battery is also convenient for your using. Using 1.4 inch AMOLED round screen with HD 400 * 400 px resolution at 287 DPI, with OLED display, which further exaggerate it’s quality and beauty. Call (only for Android), Message, Pair Bluetooth to listen to music. Heart Rate Monitor, Pedometer. Take good care of you, monitor your heart rate, record your sports data. Call Uber;”OK Google” hotword;Tilt to wake screen, drop to dim the screen; SMS reply with voice. 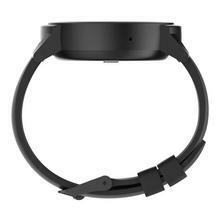 Heart-rate monitor, Proximity sensor, Accelerometer, Gyroscope, e-Compass. Powered by Android Wear™. Compatible with Android™ and iOS. the convenience of Google Assistant, fitness apps like Google Fit, and the powerful ecosystem of Google Play. built-in GPS, listen to your favorite music, and track your performance hands-free. 1. 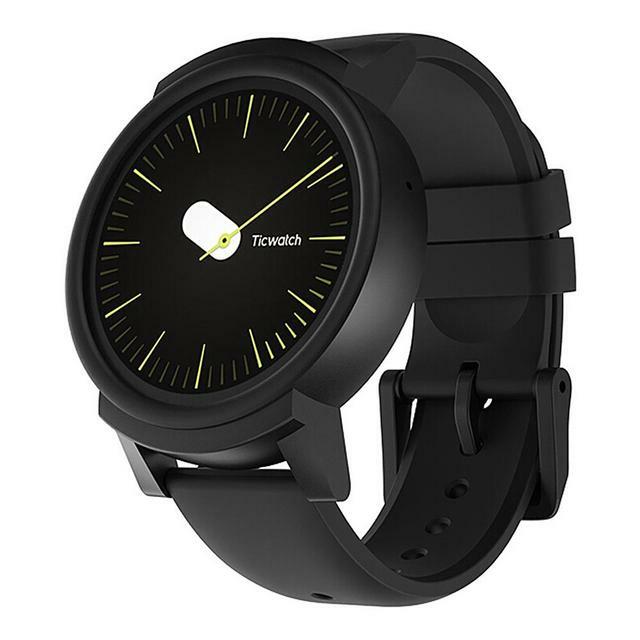 What languages does the watch support? 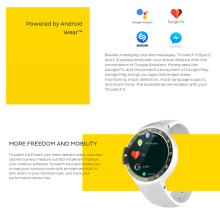 Ticwatch E can support many languages like English/German/French/Japanese/Traditional Chinese, but the system languages are English and German. 2. What kind of GPS are supported? 3. 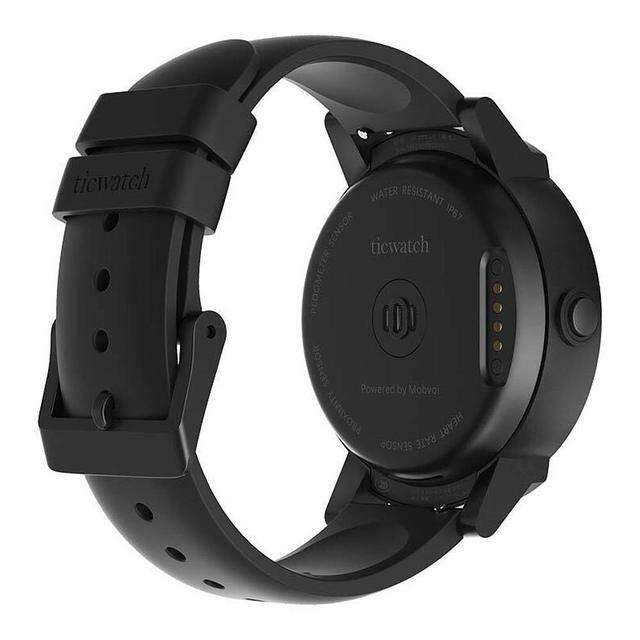 How far away can the watch go from the phone? 4. How long does it take to fully charge the watch? 5. Whether can I use third party charger? Why? 6. Can music services on AW play over headphones connected to the watch? After pairing with the phone, Ticwatc E can pair to Bluetooth headphones to listen music. 7. What health Activities does the Application Application Support? Run / Walk / Cycling / Free Style etc. Any styles on third party apps. 8. 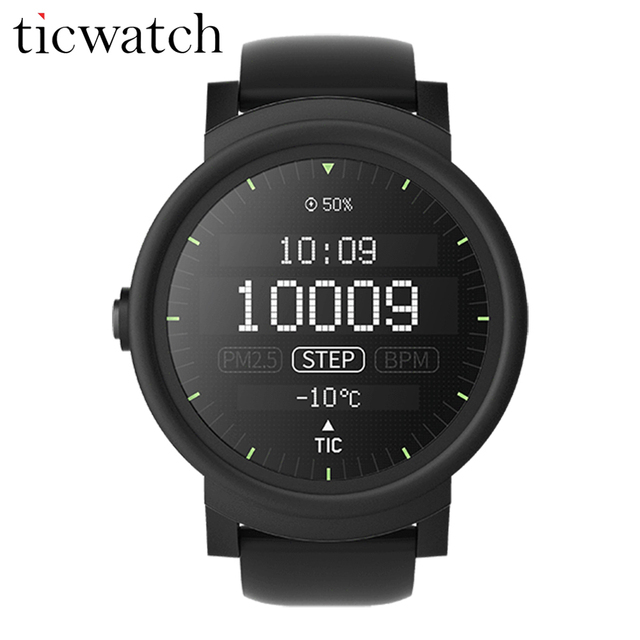 Whether the watch support wechat/whatsapp/fb messenger? Android Wear doesn’t support wechat/whatsapp/fb messenger on iOS. It supports fb messenger on Android devices, not supporting whatsapp. For wechat supporting, you need to install wechat app on your phone firstly. 9. Does it support third party music apps? It supports major music apps,like Google music and Spotify, etc. 10. Does it support third party fitness apps?Can I share my fitness data to these apps? 11. Does the watch have google map? Can I use it for navigation? 12. Does the watch support offline music play? Can I download songs on the watch? In what format? You can download music through third party apps. 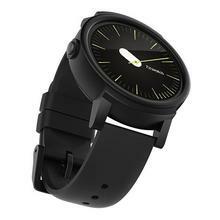 And the watch will play Mp3 and AAC format music with Compatible Wireless headset connected. 13. Can I check photos/emails/videos on the watch? 14. Does the watch support to make phone call and pick up phone call? 15. Does it support keyboard? Android Wear supports handwriting and keyboard for Android phone. 16. Can I reply text message via voice commend? Do not support iMessages, but AW 2.0 standalone store empowers many messaging apps(Facebook Messager, Whatsapp, Telegrams,etc) You can barely miss a message from your phone. 17. Can I control music play through the watch?